Welcome to Santorini Boat tour! r ideal Santorini boat tour experience while on your vacation in the beautiful island of Santorini Greece! You can choose between Luxury Private Yacht charters / Private or Semi-Private Sailing tours (That be either Catamaran or Monohaul / and for a faster-cheaper choice we offer comfortable RIB boats at reasonable prices! All with a captain and a crew to be there for your every need! Why Book a Boat tour in Santorini with us? At Santorini boat tour We have the best captains there are on our yachts. Not only because they are experienced and know the waters of Santorini inch by inch but because they are funny entertaining and good people! You can see Captain Vasilis in the picture above on one of his Yacht Charters From 2015. He loves what he does and guests onboard are always happy by the end of the day! Excellent Food : We are known to serve excellent Greek food on board and delicious wine to go with the dinner, Beer and soft drinks all included! Our Santorini boat rental packages are affordable for everyone because everyone deserves to live the experience of a cruising in Santorini on a luxury yacht! private boat tours. Most of our guests are looking for the opportunity to get out on the water onboard a private luxury yacht. Whether you are looking to celebrate a Birthday, an Anniversary, Sunset Cruise, Sandbar Party, a Marriage Proposal, Renew Vows, semi-secluded Island Hopping, Santorini boat tour itinerary; or perhaps a small destination wedding on a boat – we can help you arrange all of the details for a seamless stress-free event. Get Out on the Water Today! Rent a boat in Santorini and enjoy a fun-filled day! Affordable Boat Rentals and Santorini Boat Tours. Our all-inclusive pricing includes your Captain, crew and Fuel for up to 12 Guests on all of our boats. Look at our itineraries on Santorini Boat Rental. You may customize your cruising adventure. Start with a half day boat tour, 4 hour charter or a full day, 8 hour Santorini charter, to personalize your Santorini Boat Charter. Have the private boat of Santorini to yourselves and have a blast while on it! Swim and party in Santorini like you always dreamed see our yachts for charter in Santorini. Wether you wish to have a Private Yacht Charter in Santorini or a Sailing Semi-Private Catamaran Tour, We will provide you with the lowest rates out there. Competition has increased significantly over the last 3 years regarding Catamaran Tours in Santorini and we have been raising our standards ever since, We are the best in the sailing in Santorini game and will do our best to keep that possition. Regarding if you are having the Classic or the Gold cruise the service will be the same! Lowest Rates and Highest quality in Service with Santorini boat tour! Have a look at our Santorini Catamaran tours Page to find out more about Catamaran Charters and Semi-private Tours in Santorini. Santorini water taxi is a service provided for those who with to travel from island to island fast and safely. 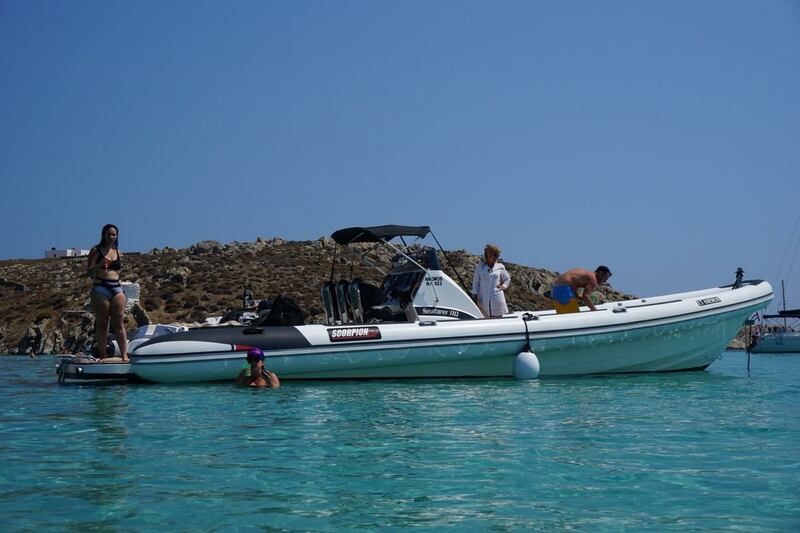 Our RIB boats are made for the Water Taxi service in Santorini especially for bigger groups as well. The bigger one has a Cabin where you can store your luggage and sit inside if you feel like it and a large deck to choose from staying in the shade or sun bathing untill you reach your destination. 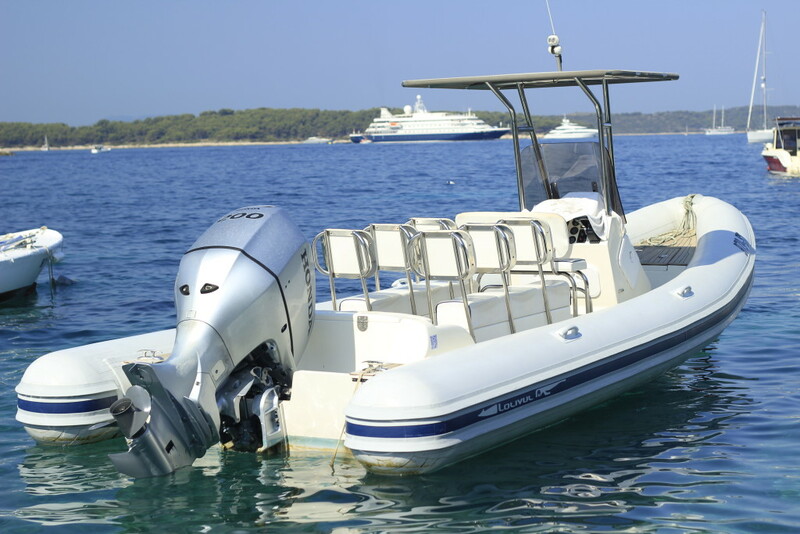 The RIB boats that offer the Santorini Water Taxi service, Are equiped with high end technology and VHF radios but with all Safety equipment required by law and more! Travel Stress free and be at your destination on time with the Water Taxi hired by Santorini boat tour.